A lost gospel, a contentious relic, and a dying pope’s final wish converge to send two brothers—both Vatican priests—on an intellectual quest to untangle Christianity’s greatest historical mystery. Ten years ago, Ian Caldwell and Dustin Thomason’s The Rule of Four became a literary phenomenon that sold nearly two million copies in North America and was hailed by critics as “ingenious…profoundly erudite” (The New York Times), “compulsively readable” (People), and “an exceptional piece of scholarship” (San Francisco Chronicle). Now, after a decade of painstaking primary research, Ian Caldwell returns with a masterful new thriller that confirms his place among the most ambitious popular storytellers working today. In 2004, as Pope John Paul II’s reign enters its twilight, a mysterious exhibit is under construction at the Vatican Museums. A week before it is scheduled to open, its curator is murdered at a clandestine meeting on the outskirts of Rome. That same night, a violent break-in rocks the home of the curator’s research partner, Father Alex Andreou, a Greek Catholic priest who lives inside the Vatican with his five-year-old son. When the papal police fail to identify a suspect in either crime, Father Alex, desperate to keep his family safe, undertakes his own investigation. To find the killer he must reconstruct the dead curator’s secret: what the four Christian gospels—and a little-known, true-to-life fifth gospel known as the Diatessaron—reveal about the Church’s most controversial holy relic. But just as he begins to understand the truth about his friend’s death and its consequences for the future of the world’s two largest Christian Churches, Father Alex finds himself hunted down by someone with a vested stake in the exhibit—someone he must outwit to survive. 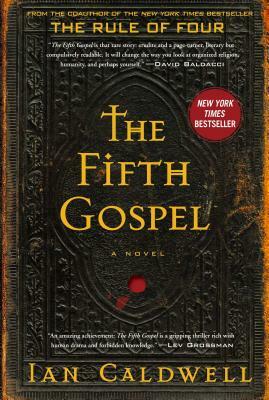 At once a riveting intellectual thriller, a feast of biblical history and scholarship, and a moving family drama, The Fifth Gospel is “a story of sacrifice, forgiveness, and redemption. Peppered with references to real-life people, places, and events, the narrative rings true, taking the reader on an emotional journey nearly two thousand years in the making” (Library Journal, starred review). Ian Caldwell is the author of the New York Times bestsellers The Fifth Gospel and (with Dustin Thomason) The Rule of Four, which sold nearly two million copies in North America and was translated into thirty-five languages. He lives in Virginia with his wife and children.